This absolutely mesmerizing end grain cutting board is handmade from premium kiln dried walnut and maple hardwoods. Its unique pattern and design captivate all who see it. 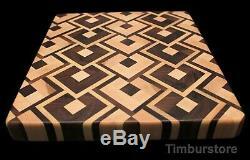 This end grain cutting board will become the focal point of your kitchen. Its elegant design will captivate all who see it. The end grain cutting boards is a very sturdy board. And is less abusive to knives. Microscopically, the fibers of the wood separate or part when the sharp edge of a knife comes in contact with it, which prevents the knife from dulling so fast. They have been hand rubbed with 3 coats of food grade mineral oil and natural waxes to completely seal the wood. This will prevent your board from absorbing moisture. Rubber feet are attached to the bottom. Our boards are made to last you generations with the proper care. This handmade end grain board will be an excellent personal and corporate gift for any occasion. Beautifully made gift handcrafted in Los Angeles, California. Titebond III (Waterproof and Food Grade glue). Rounded top edges and bottom edges. 3 coats of food safe mineral oil and natural waxes. Sanded smooth down to 400 grit. Board measures approximately 12.75" x 11.50" x 1.50 thick. The item "Walnut & Maple End Grain Butcher Block / Cutting Board / Cheese Board" is in sale since Thursday, March 21, 2019. This item is in the category "Home & Garden\Kitchen, Dining & Bar\Kitchen Tools & Gadgets\Cutting Boards". The seller is "taznguyd2012" and is located in San Gabriel, California. This item can be shipped to United States.